BBC Blogs - Eurovision - We’re opening our song submission for Eurovision 2019! We’re opening our song submission for Eurovision 2019! Today we can confirm our participation in the 64th Eurovision Song Contest held in Tel Aviv, Israel next May; by opening the public song submissions to find the UK’s entry. As last year, all public entries will be shortlisted by a representative panel of official UK Eurovision Fan Club (OGAE UK) members. While entries are also being sought from leading professional songwriters, with guidance from songwriter, publisher and new Music Consultant for the BBC, Greig Watts. A final shortlist of songs, from either route of entry, will be showcased to the UK public, who will have the chance to vote for their favourite in Eurovision: You Decide on BBC Two. More details about the show will be announced later this year! Within 72 hours of sending the email you will receive instructions on how to upload AN ENTRY to the BBC Eurovision portal. This should be MP3 only. Please do not attach your MP3 to the email. The following Terms and Conditions apply. Six acts, three songs, You Decide returns in 2019! Welcome to the official BBC Eurovision blog. 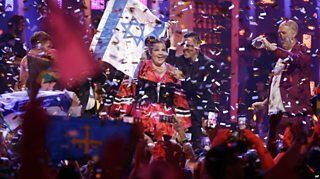 Keep up to date with all of the very latest news about the UK delegation and Eurovision Song Contest here.